When we donate food at a can drive or through our local school, church, or other non-perishable food donation program, how often do we stop and consider the quality of the food we are donating? In most cases, canned goods and boxed food have extremely long shelf lives and offer little nutritional value. Foods like these can be healthy, but more often than not they are full of preservatives, artificial ingredients, and high levels of sodium and sugars. At the Community Food Collaborative, we believe that everyone deserves access to healthy food options like fresh fruits and vegetables. Therefore, to help our neighbors at the food pantry the Rotary Clubs in Sturbridge and Southbridge have collaborated and formally chartered the “Rotary Community Corps of Sturbridge & Soutbridge”, whose primary project is this “Community Food Collaborative”. So, we have developed a volunteer-based community garden where we grow produce that we will entirely donate to the St. John Paul II Food Pantry in Southbridge, which serves those in need in both towns. In addition to donating nutritious food to the hungry, the Community Food Collaborative is a great way to socialize, network, and become more active in the community! Volunteers can work alongside like-minded people to learn and/or share knowledge about gardening in a fun and friendly atmosphere. The St. John Paul II Food Pantry was founded in 1991 by the Society of St. Vincent de Paul. The Food Pantry is a non-denominational, not-for-profit organization that provides nutritional food for hundreds of needy families in both Southbridge and Sturbridge. The Pantry serves an average of 350 families or 1,000 needy people each and every month. Last year the Pantry distributed about 325,000 pounds of food to needy seniors and families. It is a client-choice Pantry, so clients are able to choose the foods they like. The Pantry also tries to accommodate those with special dietary restrictions. In Massachusetts, one in ten people struggle with hunger. Many of these people are working, but are unable to make enough money to pay all their bills and still feed their children. Some are single mothers hoping to make ends meet. Many are children who go to school hungry. Any many are the elderly living on a fixed income. There are more than 70 volunteers who work together to ensure the Pantry is run efficiently. In doing so, these volunteers have donated 25,000 hours of their time. Recognition also goes to the Pantry’s very generous food sources including many local grocery stores as well as businesses, civic and social organizations, churches, schools and numerous food drives. 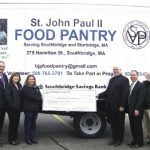 The St. John Paul II Food Pantry is located on the lower level of the St. John Paul II Parish Ministry Center at 279 Hamilton Street, Southbridge, MA 01550. Contact them at bjpfoodpantry@gmail.com or call at 508-765-3701 for hours of operation. The Pantry is also on Facebook at www.facebook.com/SaintJohnPaulIIFoodPantry.